Part of what I like about real estate is the psychology aspect. We tend to view our homes as extensions of ourselves, and in many ways they are. Are you a flashy person, a compulsive person, or a modest person? Chances are, your home expresses these qualities as well. 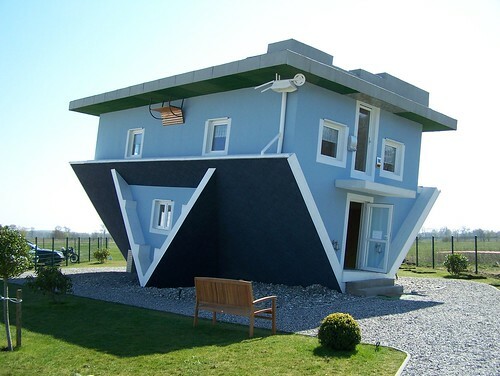 This house might mess with your mind! I’m going to make the Psychology of Real Estate a recurring category. The two subjects are just so connected, in my opinion. I’ve got a degree in psychology and now my real estate license, so I like to think I know what I’m talking about. But really, both of psychology and real estate are heavily based in observation. As in life, there are many decisions to make in regards to real estate. Everyone needs a place to live, so these choices will be made one way or another, actively or passively. Whatever your choice, our homes do become part of us. Memories are formed there, meals are cooked, and we move on a bit older and (hopefully) wiser. Do you feel your home reflects you as a person? Or is it just a place to crash? Photo is from Flickr user backkratze and is licensed through Creative Commons. I'm a local in Bellingham, Washington, and love living in the Northwest. From local events and activities to photographing the gorgeous scenery, I post about what interests me. I hope this blog inspires you to remember the small joys in life too! Feel free to comment, or find my blog page on Facebook. I love thoughts, comments, and suggestions! All blog posts copyrighted by me, Mariah Vasel. All photos not bearing 'photo by Flickr user.....' also copyrighted by me. Thanks for reading!